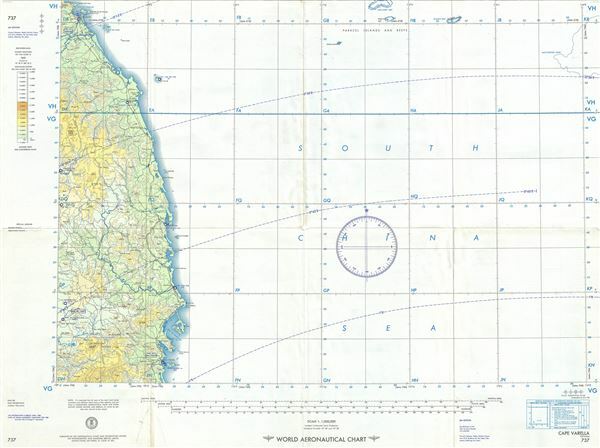 This is a fine 1958 U.S. Air Force aeronautical chart or map of the eastern coast of Vietnam. It covers the central portion of Vietnam's eastern coast from Da Nang south as far as Nha Trang and inland as far as Buon Ma Thuot (Ban Me Thuot). The map is highly detailed, noting towns, rivers, cities, mountains, bays and other hydrographical and topographical features essential for the air pilot. Verso of this chart features legends and a world aeronautical chart index. This chart was published by the USAF Aeronautical Chart and Information Center and was issued as chart no. 737. First issued in 1955, this is the sixth edition revised to April 1958. Very good. Minor wear and toning along original fold lines. Small part of map missing near centerfold intersections. Minor spotting.